Prom is not only a very important and touching event in the life of a high school graduate and his parents. It is also a milestone between childhood and adulthood. So to prepare for such a celebration must be especially careful. Of course, the first thing you try to do parents of graduates it's the same dress. Etiquette in this case is very complacent to young people. For they prescribed a rule that the ball must be put on a strict classic suit. The only way to change is to put an order. The choice of the rich. 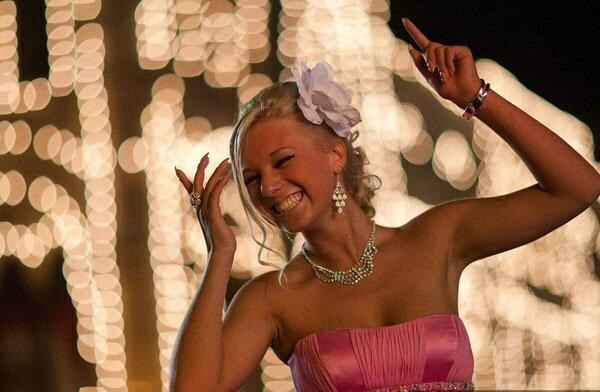 Quinceanera ball dresses, cocktail outfits - you can choose whatever you want. The main thing is to pick an outfit for the figure. And then properly collect the whole image - a hairstyle, shoes, accessories and handbag. It is desirable to find a hairdresser that will do hair graduate, at least for a month or two before the event. By the way, to sign up to it must also advance, otherwise solemn day hairstyle will have to do yourself. At the first meeting with the hairdresser need to bring a picture of the dress so master will be easier to navigate and to choose the appropriate hairstyle. The rule "beforehand" works in the case of other artists, specializing in beauty specialist in manicure, pedicure. The Solarium is also applies to. You should carefully consider the make-up. Prom is recommended to do gentle, almost imperceptible make up. Girls should not choose bright colors better than pale peach or pink tones. If you overdo it with makeup, the young lady will lose its charm and turn into an adult woman. And the prom is first and foremost a celebration of youth. As for the manicure, it also needs to be very careful. Ideal for prom - manicure in the style of the French. If a graduate of the French does not like, she may prefer a light Polish. Shoes pick up not only beautiful, but also very comfortable. After dancing they'll have all night. A view of elegant dresses, combined with bare feet due to the fact that the feet are chafed and swollen, not the best way, prom. Just before graduation, you must take care of the body and face. Perfect tonic bath. After you need to apply a moisturizer all over body and face. The skin has a nice shade, experts recommend to apply to the skin a special cream with a shimmering effect. The skin also needs to thoroughly prepare to make the mask, moisturize. And only then proceed to applying makeup. The success of the prom is in a good mood. This will give the image of completeness.